GET YOUR FREE QUOTE FROM THE LEADING CHICAGO MOVING COMPANY. Chicago is home to over 2,500,000 people. That being said, moving into or out of Chicago can be a daunting task. That’s where Advantage Moving & Storage can help. With our top-rated Chicago moving company, you can count on us to make your move in to or out of Chicago easier. Are you in need of residential moving services? From pre-move planning to unpacking, our trusted Chicago movers will give you the exceptional service you need to make your move easier. Our Chicago movers are expertly trained in the best practices for packing, loading, moving and unpacking. We are committed to taking care of all of your residential moving needs. Are you in need of commercial moving services? 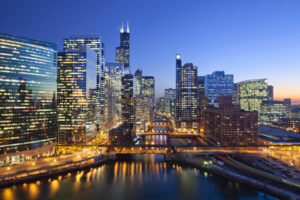 Our Chicago business relocation experts are ready to move you in a manner that least disrupts your business, providing you with as efficient and painless of relocation services as possible. From building a customized moving plan, making your move as professional and efficient as possible, to completing installation services, making your business facility fully functional, we look forward to providing you with exceptional office reloation services and caring for all of your commercial moving needs. Are you in need of storage services? Not only are our Advantage storage facilities climate-controlled, they are furnished with cutting edge security and surveillance systems. So, whether you are storing seasonal household items or store commercial inventory, our top-rated storage services ensure that your items remain in the best condition. We are ready to offer you both the short and the long term storage solutions for household and commercial items. Contact Advantage Moving & Storage today to learn more about how we can make your Chicago move easier and schedule your free moving and storage quote.